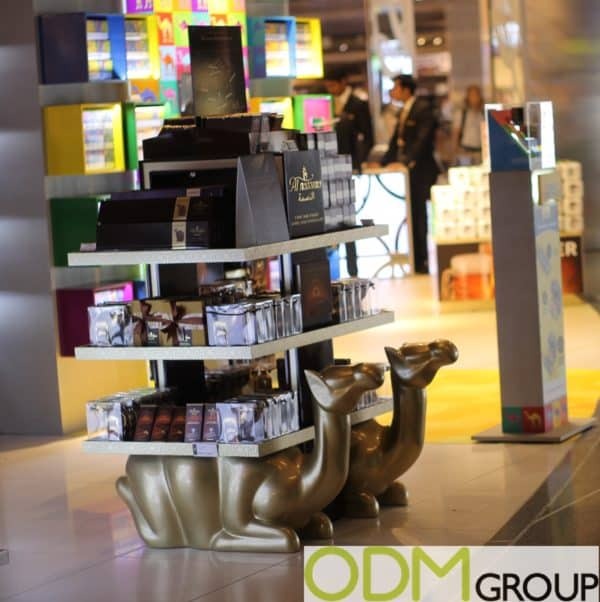 Al Nassma recently advertised with a Custom POS Display in the duty free zone in Qatar. The promotion with a POS Display is often used by brands, that’s why you need to think about such a Custom POS Display to gain more attention to your brand and products. This custom POS Display is gaining a lot of attention by its design of camels, which provides the brand the attention and glamour it deserves. But not only the camels are gaining the attention to this camel milk chocolate and brand, also the shelf itself is, with its golden color increasing the attention to this company and sales of these products. To have such a custom POS display will not only gain the attention to your brand and company, but also your sales through this whole campaign is going to gain a boost. Why should you think about a Custom POS Display? Unique but effective. A POS Display is used by many brands, which means that you need to come up with a new, unique design for your custom POS display. This design above is a original design, which you would not see at any brand. Additional customers. After using such a custom POS display your brand awareness will be gained a lot of attention and this will not only influence the current but also potential customers and will increase your sale on these products. At ODM we have significant experience in product design, sourcing and manufacturing. We can help you with your marketing budgets effectively. Be sure to contact us if you are interested in finding out more information about a Custom POS Display. Please find Custom POS Display related links below.